I have a fun throw back workout for you with two special guests! I love when I am joined by family and friends for workouts. I think it helps to see people of all levels pushing through a workout. The nice thing about HIIT is that you can push as hard as you are able to, and that is different for everyone. In this video, my sister, Kristen, and her fiancé (now husband! ), Jason joined me for another workout. They had previously joined me during the 30 day challenge for Day 7: Wedding Boot Camp workout. I hope you enjoy today’s workout! I am almost at the end of my pregnancy! I did a HIIT workout yesterday, and got in a nice walk today. I am currently 38 weeks and 4 days pregnant, so we shall see when Baby Bender decides to make his debut! Melissa. I wish you all the best for the remainder of your pregnancy. Your new baby will be very lucky to have two wonderful parents in you and your husband! Thank you for your fantastic workouts. 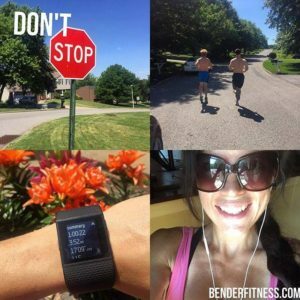 I have been doing them on a daily basis for almost a year, and my energy and fitness levels have been transformed! Melissa, I really appreciate seeing Jason & Kristen on this video. As someone on my own fitness journey, it is refreshing to see people who aren’t in your tip-top shape sometimes! I find you very inspiring always!